I don’t have takeaways very often (this one was only the fifth one this year I believe) and when I do I am generally a little (and sometimes very, very) underwhelmed with what I get. The oil to food ratio always seems to be way too high and somewhere in the process flavour is lost. This is my experience of the better examples, the worse ones serve up lumps of unidentifiable meat sitting in a brown, orange or gray sludge with a layer of grease floating on top. 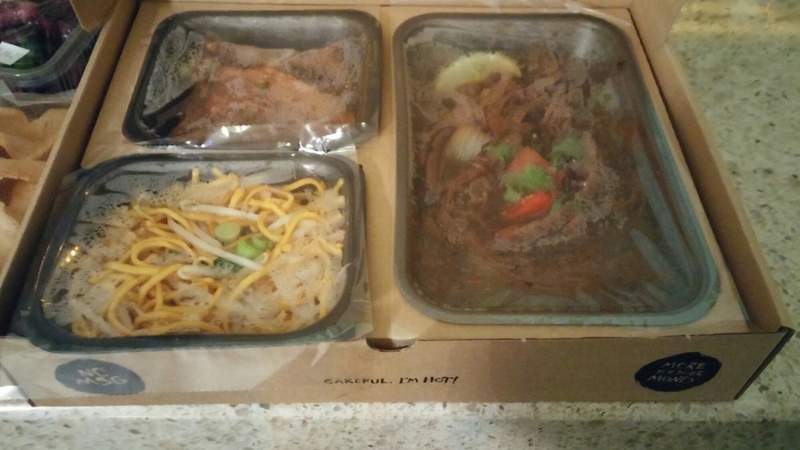 The last takeaway I had, before this one, was a Chinese where the crispy beef was pretty much exactly how I would expect a deep fried elastic band to taste like. There are some good ones around (Purple Poppadom and CN spring to mind), but they seem to me to be few and far between. 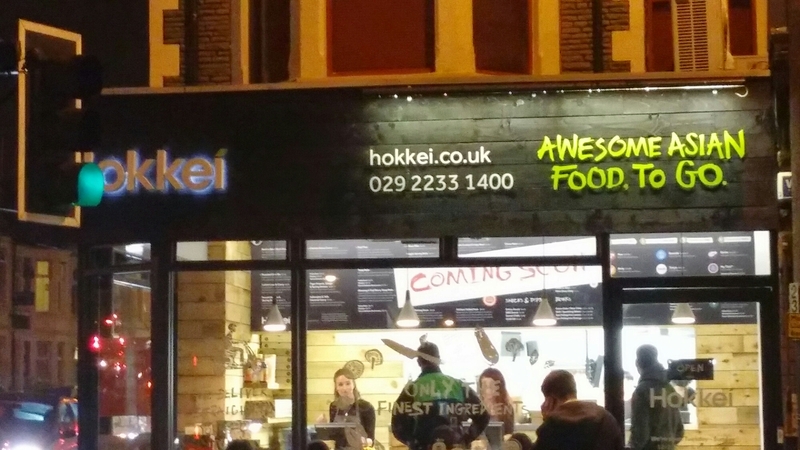 I, however, had very high hopes for the new kid on the block (takeaway wise) in Cardiff in the form of Hokkei. It has a strap line that promises “Awesome Asian food, to go”, which is a lot to live up to. Having tried and failed to get through on a Friday evening, I called the next week on a Wednesday at lunch time and put my order in for collection at 6.30 pm. All went very smoothly regarding collection, with a minimal wait and very nice, friendly staff. 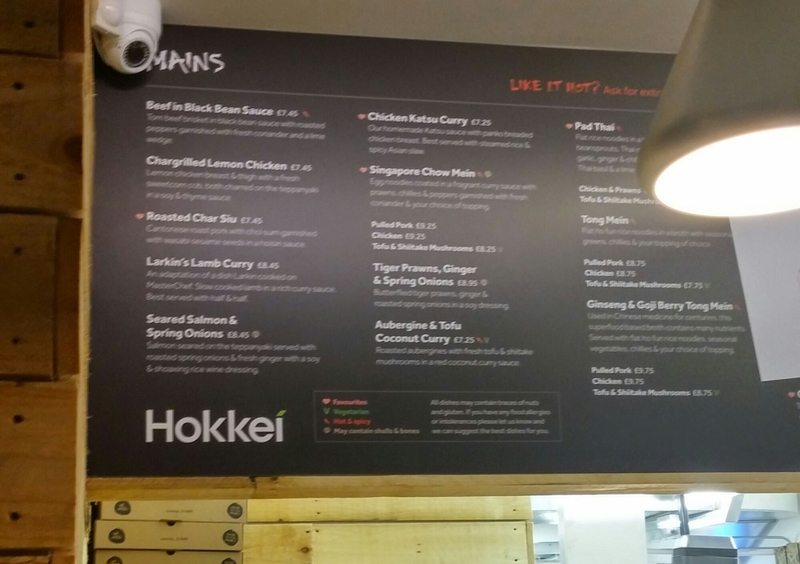 The Hokkei meal concept works on the basis of a main dish linked to the box name and then your choice of a side (rice, noodles etc), a dim sum/starter and an extra. There is then an all in price for the so constructed box. 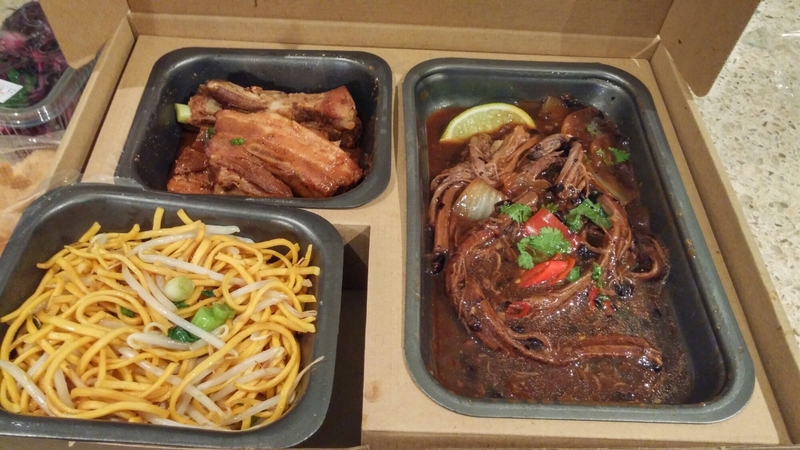 I went for the Moo box (beef in black bean sauce), a side of chow mein, a dim sum of 8 hour ribs and an extra of Thai crackers. 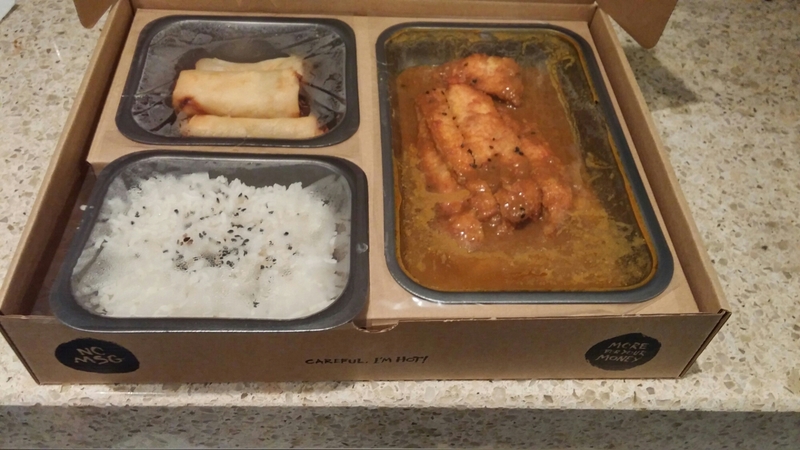 Mrs. SF opted for the Tokyo box (katsu chicken curry), veggie spring rolls, steamed rice and Asian slaw. The dim sum/starters were knock out. The spring rolls were lovely and crisp without a hint of greaseness inside or out. They had fresh, crunchy, nicely flavoured veggies and herbs on the inside and were just great. The 8 hour ribs were even better. Slow cooked to the point where they were meltingly tender with the bone simply sliding out from the meat. The ratio of meat to bone was (contrary to the norm for a rib dish from most takeaways) very good and the meat itself full of flavour. It came in a lovely aromatic Asian spiced BBQ sauce which, much to Mrs. SF’ s disgust, I drank directly from the container it came in after demolishing the ribs. It was just all round lush. Both were scoffed before I even thought to take a picture. 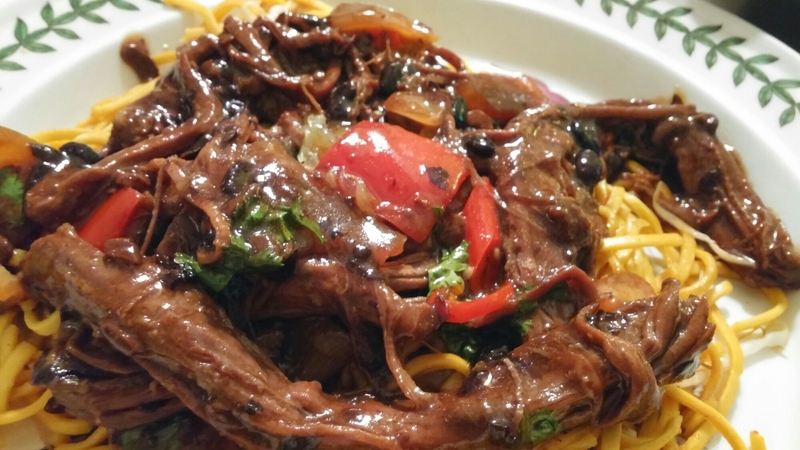 On to the mains, my beef in black bean sauce was choc-a-block full of tender as you like brisket (nice to see this great flavoursome, but shamefully underrated in the UK, cut of beef used here), with some sweet roasted peppers and a few (but not the excess you often find in Chinese takeaway food) onions. The sauce was fragrant and silky smooth, managing to be both light and full of flavour. The addition of a wedge of fresh lime to squeeze into the dish and chopped coriander topped it all off nicely. The chow mein was equally good. Perfectly cooked noodles without the clagginess or greasiness you often find with this dish, especially when it comes as a takeaway. The addition of bean sprouts and spring onions added nice crisp texture and freshness to the dish. It went really well with the beef. Mrs.SF’s katsu chicken consisted of a good portion of tender and tasty chicken in a nice panko crumb coating and a lovely spiced (rather than hot) Japanese curry sauce. The sauce was heady with aromatic spices and utterly delicious. If I was being ultra picky, the fact that the chicken came in the sauce (and was subject to the heat within the sealed container it came in on the journey home) meant the panko crumb coating had gone a bit soggy by the time I got it home. The steamed rice was cooked to a perfect fluffiness, nicely seasoned and was lovely with the chicken and sauce. My Thai crackers were excellent – not the usual tasteless pieces of polystyrene here. Crisp and packed full of proper Thai flavours. Mrs. SF’s Asian slaw was even better. Red cabbage and cucumber based, it came with a lovely dressing (in a separate pot so the slaw remained nice and crisp). This chiu chow chilli based dressing (must admit I thought there was wasabi in there – shows what I know!) gave a nice kick to a very refreshing and lovely tasting salad. Forgot to take a photo – sorry. 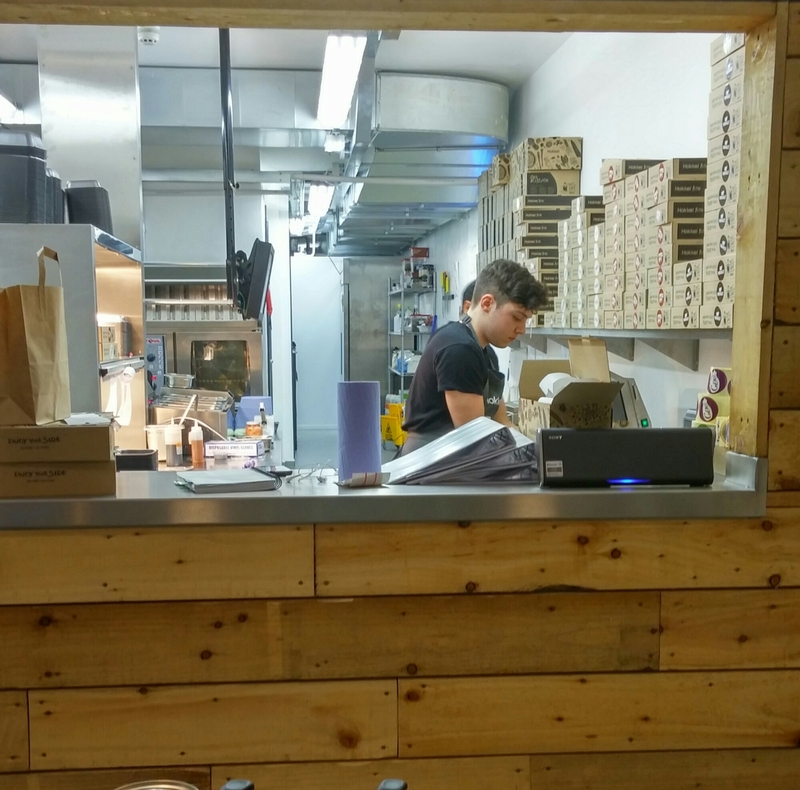 The takeway boxes that the food came in are a really good design, which stops that perenial takeway problem of sauce in the car footwell as the bag tumbles over on a corner. These beauties lie flat like pizza boxes, with the food resting in containers that sit in separate compartments. This also means if you so wish (Mrs SF and I didn’t) you could easily eat the stuff straight out of the box on your lap. Not one for TV dinners me, but handy if you are and saves on the washing up I suppose. The boxes are, I suspect, not cheap to 😉 buy and I was left with two in pristine condition that were perfectly reuseable in my opinion. Rather than these just going in the recyle bin, an idea would be to incentivise people to bring them back pristine ones (offer of a small discount maybe ). Cost effective and environmentally virtuous. Win win, I think. 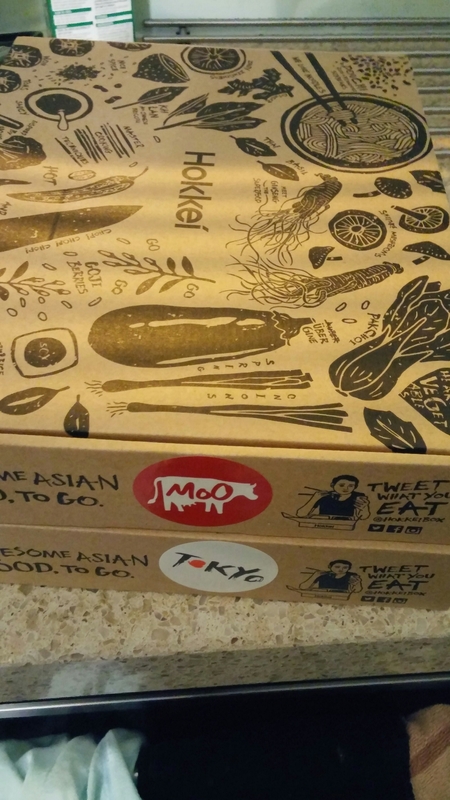 Price wise, the Moo box was £13.95 (all in) and the Tokyo box £13.45, making a total of £27.40 . 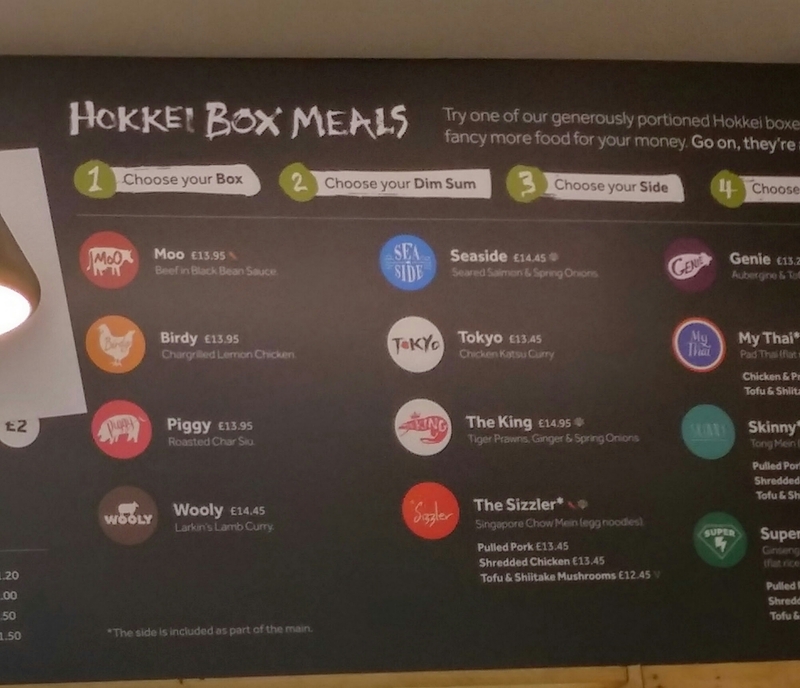 Boxes range from £13.35 for the veggie option “Genie” box to £14.95 for the “King” prawn box Certainly not cheap, but for the quality not prices I begrudged paying one little bit. 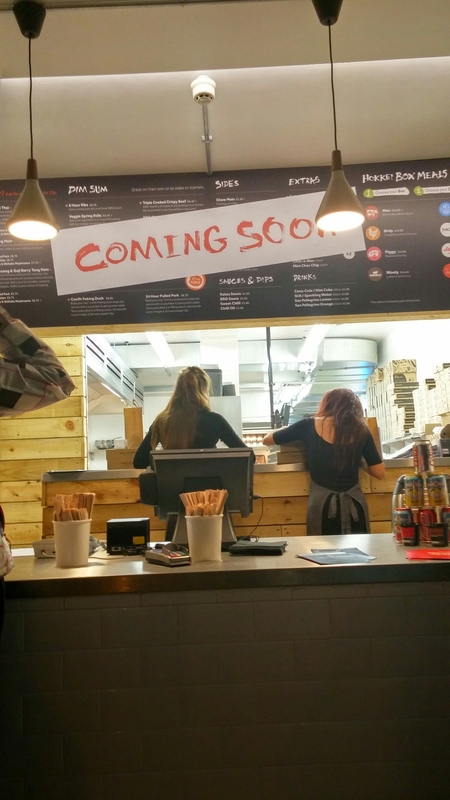 Mrs. SF and I really enjoyed Hokkei which to me provided what was one of the (if not the) best takeway I have had in many a year in Cardiff. It appears to be a roaring successful and that is because they more than live up to their promise of serving up awesome Asian food. Would I go back? 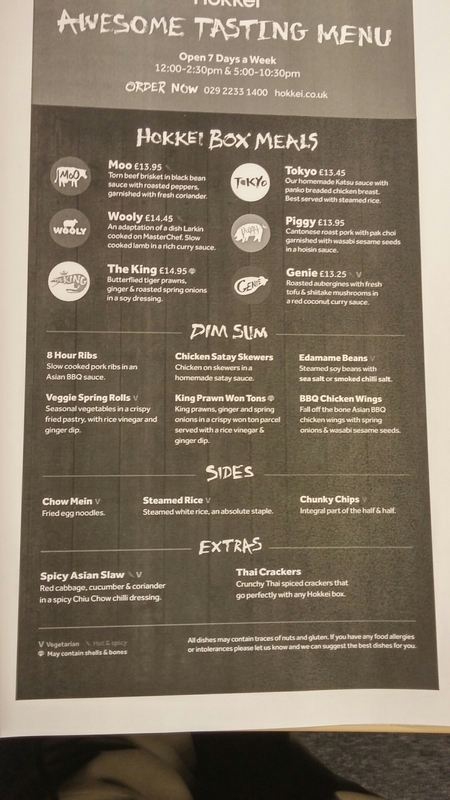 Hell yes – need to get my chops around the rest of the growing menu. The bao (filled chinese steamed buns) are very good from new menu. It was still phone and pick up in store only when I went, but plans are for delivery and also online and app ordering. 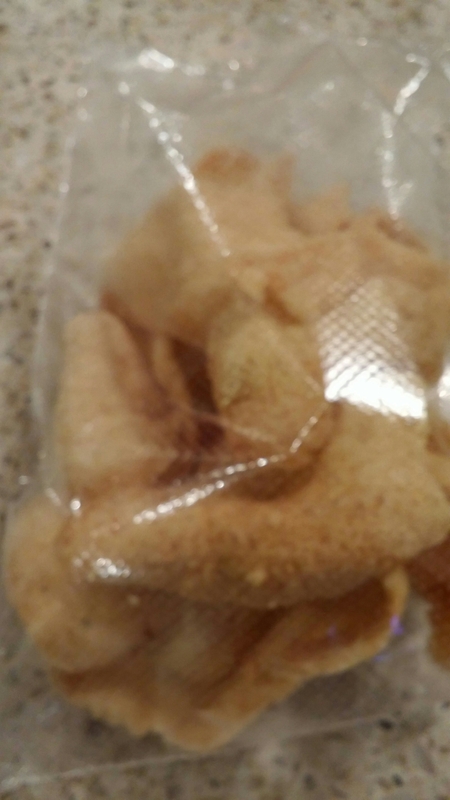 This entry was posted on Dec 7, 2014 by solicitingflavours in Cardiff, Chinese, Food and wine products, Hokkei, Indian, Masterchef, Restaurant Review, Take away, Wales.